Therapists say that the first step to fixing a problem is first admitting that you have a problem. So, here I go: I eat too much ice cream (or ice cream related products). Of course, the second step to fix a problem is actually wanting to fix the problem and in the case of frozen desserts, I'm not sure I ever want to stop eating them. So, in that quest to never solve that problem, another sale at my local Kroger led me to try out another Breyers Blasts! 1.5 quarter container with this Breyers Blasts! Waffle Cone with Chocolatey Chips Frozen Dairy Dessert for $2.50. I've seen a couple of reviews of this on the internet at On Second Scoop and Junk Food Guy that have made me want to eat my hand, so I'm surprised it took me this long to pick it up. Oh by the way, the container has about twelve half-cup sized servings and each serving is 140 calories. As you can perhaps read on the container, this container is made up of "Fudge Covered Waffle Cone Pieces with a Caramel Swirl and Chocolate Chips and Vanilla Flavored Frozen Dairy Dessert." Whew, that's a long description to digest and frankly, it's fitting because there was A LOT of all of that going on in this container. The whole point of the Blasts! line is that they overfill the container with add-ins and that was certainly the case with this container. There were waffle cone pieces, caramel swirl and chocolate chips everywhere I looked and being that I prefer to chew my way through ice cream, I LOVED the fact that this was composed that way. One thing I will note though, although it doesn't really matter, is that the chocolate chips were actually more like squares and not the traditional tear drop shaped morsels that we've been conditioned our entire life to look at. Anyway, with my mouth watering and my eyes bulging from the cornucopia of perceived joy in front of me, I was ready to dive in. And dive in I did as I devoured spoonful after spoonful of this delicious treat. The waffle cone pieces and "chips" had a wonderful chocolate flavoring and crunch that was accented by the gooey caramel to make a delightfully sweet treat. The vanilla frozen dairy dessert was nothing special as it was slightly thin like frozen dairy dessert tends to be, but that really didn't matter because this was all about the add-ins and if I haven't said it already, I'll say it again...they were wonderful. Everything about this between the crunch of the add-ins and the gooeyness of the caramel and the chill of the frozen dairy dessert was absolutely wonderful. Buy It or Fly By It? Clearly this gets a BUY IT rating and is easily my favorite of all the Blasts! flavors I've had so far. There's a chance this one might hold up over time as well because it is that darn good. 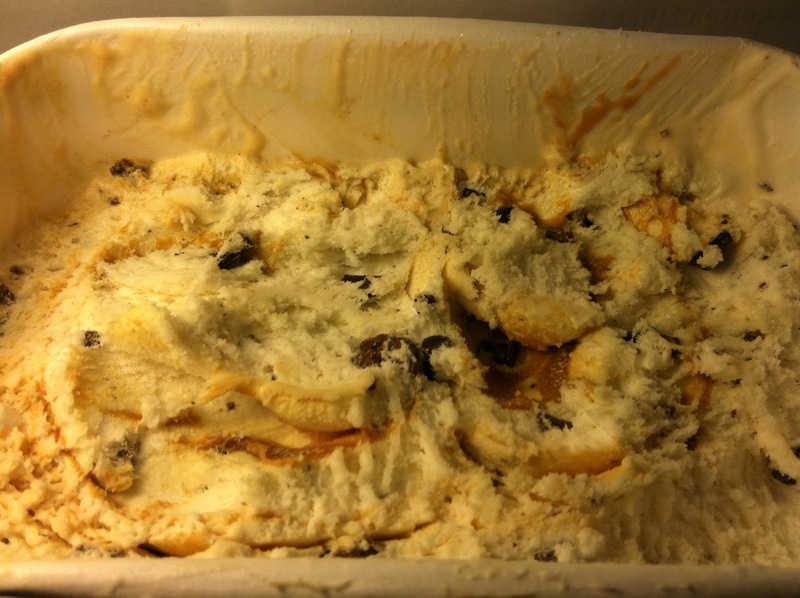 It's everything I love about frozen desserts, meaning that I can chew my way through it and since I'm a crunchy junkie, that's all I ever ask and that's exactly what Breyers delivers with this wonderful sweet treat. It's just too bad it's frozen dairy dessert and not typical ice cream, although if it was ice cream, it wouldn't be such a calorie "freebie", so to speak (of course, I mean "freebie" compared to actual ice cream). have you had haagen dazs waffle cone, or BnJs americone dream? curious how it compares. I've actually reviewed Americone Dream here on the blog and liked it a lot. I would say it is better because it is real ice cream unlike this. I bought this today because of your review. 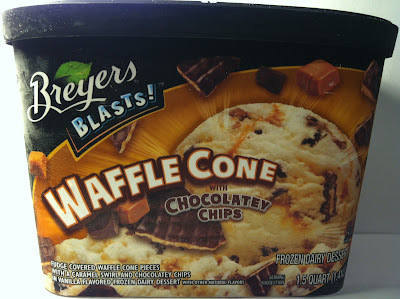 :) It tastes just like the ben and jerrys one except the breyers version has a lot less waffle cone pieces(I guess that's why this also has less fat? ).